Change Islands is an artists paradise rich in geologic features and historical architecture, with salt box houses, tidy gardens and red ochre fishing stages and stores that hug its charming coves. The web server used by Changeislands.ca is located near the city of Houston, USA and is run by CyrusOne LLC. 40 other websites are located on this web server. Most of them are provided in the english language. 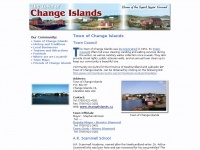 The websites of Changeislands.ca are served by a Nginx server. The website does not specify details about the inclusion of its content in search engines. For this reason the content will be included by search engines.